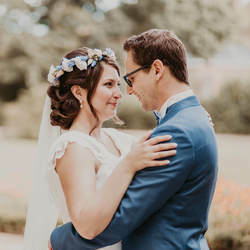 Actually we can't thank you enough for these artisticially captured emotions, the excitement and all those lovely, little instants that made our big day so special. You make it possible for us to be right in the moment again and to feel the same happiness just by looking at the images. We couldn't imagine our wedding pictures to be more perfect! At first we were a little worried to have you accompanying us just for 6 hours, but now we know for certain that this was a well better investment than a whole day coverage with some other photographer. Thank you so much for the wonderful shoot, the stunning results and your love and time to present our images. It was truly a great experience!!! The pictures are simply magnificent!!! you accompanied us for one year now and time flies! Now we've already been married for 6 weeks and all that excitement towards our wedding is gone. It's sad and it's beautiful at the same time. Though it is your stunning images, which give us the opportunity to think back on this day and to feel all these lovely emotions again. We want to thank you a lot for it and not just for these wonderful pictures from our day, we thank you for your great and trusting way to work with us too. Our families and friends are thrilled for you and your work as well. We hope you'll make a multitude of other lovebirds as happy as you made us! My God, it's sooo wonderful to look at these images again and again! The magic you performed is incredible!! We'll surely remember this amazing day for our whole lives! we want to thank you deeply from our hearts for your stunning images of our wedding day! How do you imagine your perfect wedding photographer? Of course someone who enables you to live that big day again through the images. With you Florence, we got a lot more, than just images. The whole time you felt more like a guest than a vendor to us. We could be just us, without acting stiffly for the images. You were here and there, but most of the time we didn't notice at all how you captured all these moments and details! Always there, but never obstrusive. In your images we have everything as a whole and the thousand little details as well. The right moments, the right locations, with the right motif. …that's why you were the perfect wedding photographer for us on our wedding day. what could we say? That afternoon was simply perfect! The castle! We are still into raptures about it. Quite apart from the marvellous images! You're an amazing photographer! at first we want to thank you again: THANK YOU! It's hard to describe the feelings we feel, when we look at the images of our wedding. Every image evokes the exact emotions we had in those moments. You ensured, that we can live this wonderful day over and over again. You captured so much love an warmth in these images... We're truly speechless! My mother got it to the point in one sentence "These images have their own soul!" You're not a photographer, you're an artist. And again THANK YOU for everything! We both love our images and you captured us so well individually and as a couple! I was very surprised I (Patrick) could look like that. The ambience was marvellous. I never had a professional photoshoot before and I'm absolutely thrilled. I guess, I speak for both of us when I pronounce a big thank you. You had such a calming way, that made my nervousness disappear. Jolina is quite a pro in these things. We thank you a lot and wish you fun and success with your work. They brought as back up there a little, back into these breathtaking moments, you photographed so marvellous and emotional. You truly have a wonderful view on such things. Thank you, for capturing us through your eyes. We want to thank you deeply from our hearts! For your amazing work, the incredibly calm atmosphere, surrounding you and your loving engagement to make us completely happy. You became an unforgettable part of our wedding we will always remember with great joy, because of your delicate images. We wish you a great wedding season and strongly recommend you. It was simply a pleasure to work with you - It didn't feel exhausting for us at all. We thank you deeply from our hearts for everything!